Although the Conservatives find themselves preparing for a shift back into the opposition benches after nearly 10 years, the party didn't incur a loss great enough to warrant a rethinking of its approach to politics. The loss of seats was, in part, a response to Harper -- it was an anti-Harper vote. So, the loss of seats may not be as devastating a signal for the party's ideology or organization as it might first appear. There comes a time for the electorate when [leadership] turnover is necessary. Dan Darrah Straight edge, journalist, A Fire Inside superfan. Although the Conservatives find themselves preparing for a shift back into the opposition benches for the first time in 10 years, the party didn't incur a loss great enough to warrant a rethinking of its approach to politics. Elizabeth Goodyear-Grant, a Canadian politics associate professor at Queen's University, says the Conservatives' loss rests much more on outgoing Prime Minister Stephen Harper's leadership than on policy. 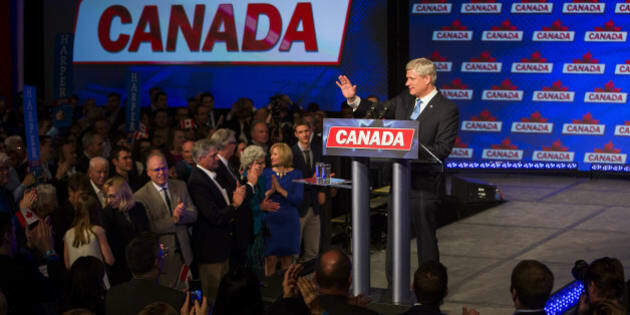 "The loss of seats was, in part, a response to Harper -- it was an anti-Harper vote. So, the loss of seats may not be as devastating a signal for the party's ideology or organization as it might first appear," says Goodyear-Grant. "No leader since MacDonald and Laurier has won four consecutive elections -- there comes a time for the electorate when [leadership] turnover is necessary." Now on the hunt for a new leader, the fresh face that emerges is unlikely to depart from the party's strong, conservative western base -- but the "style," Goodyear-Grant says, might be different. "Choosing a leader with a more open and democratic style will go some distance. This appears to be the style of Trudeau -- with the pledge to investigate electoral reform and appoint a gender-parity cabinet." The new leader, she muses, will need to be bold and perhaps youthful to effectively "give Trudeau a run for his money in the next election." Newly elected Ontario PC Leader Patrick Brown has appeared to echo the calls for less heavy-handedness, saying in an interview with CBC that the top-down administration was partly to blame for its 2014 loss under Niagara West MPP Tim Hudak. Characterizing himself as a team player and dedicated to avoiding blind partisanship, Brown says there's no "monopoly on a good idea." "If an idea comes from the NDP, from the Liberals, from a red Tory, from a social conservative -- if it makes sense for Ontario, I'll vote for it." The leader has since supported an NDP private members bill to streamline benefits for workers in Ontario suffering from PTSD. "That sort of style could help the Conservative Party, [and] Brown is young, enthusiastic and charming," Professor Goodyear-Grant says. While Jason Kenney, a rumoured leadership contender, represents an "old guard" of the Conservative Party -- which may not be much of a "break" from Harper's "heavy-handedness" -- a bold and young face like Michelle Rempel's might bring something else to the table, the professor says. Rempel, a 35-year old MP for Calgary Nose Hill, became Minister of State after being elected in 2011. Despite the Liberals gaining ground in Calgary on October 19, Rempel held onto her seat, and pundits have since been rumouring a leadership bid. Her presence in the Conservative caucus, Goodyear-Grant says, represents a "major shift" due to her liberal approach to social and economic issues. But even Rempel's potential leadership won't be enough to return the Conservatives to its Red Tory days under Joe Clark and Brian Mulroney. The party, suffering devastating losses in Atlantic Canada and Ontario where Red Toryism flourished, will be rebuilding from its conservative, western foundation outward -- largely ensuring that its Canadian Alliance wing is "kept happy." "This is where the strongest, most loyal electoral strength is -- it's a major part of the party's base," says Goodyear-Grant. "[Red Toryism] has been dead for a while, in my view," she adds. "The new Conservative Party of Canada [and its ideologies] are largely 'inconsistent' with the old progressive-conservative tradition." The Conservatives' interim leader is planned to be selected on November 5, the day after the unveiling of Prime Minister-designate Justin Trudeau's cabinet.